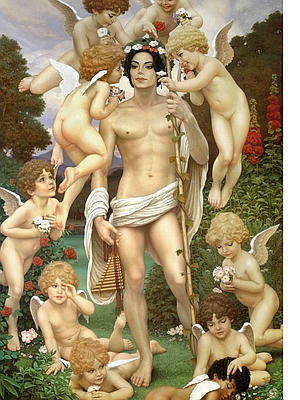 Today’s Huffington Post links to a Nypost article on “the creepy painting” of Michael Jackson in Michelangelo’s David pose, surrounded by cherubs. 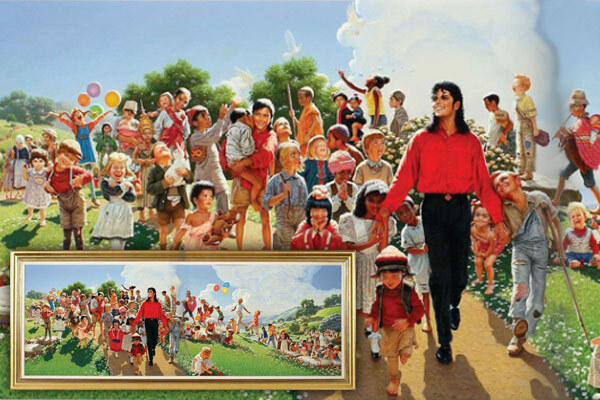 We are told that it was commissioned in 1999 from the artist David Nordahl. 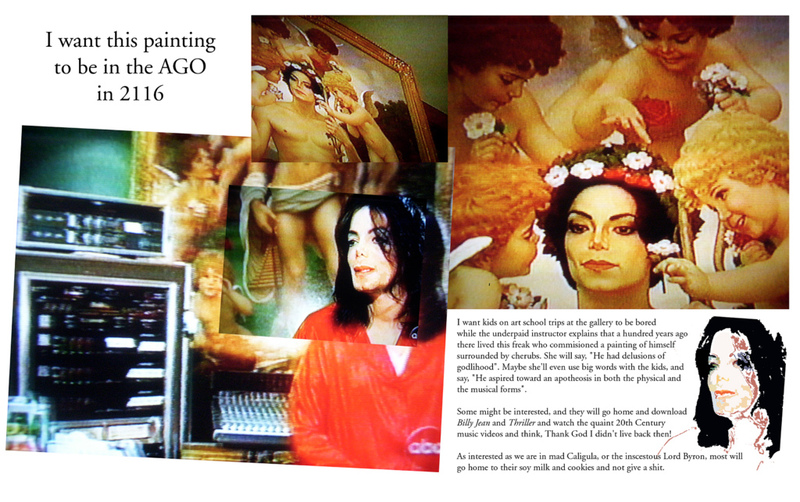 This painting was glimpsed in the 2003 documentary by Martin Bashir, and from which I took the screencaps to compose the piece (below) I had in Zsa Zsa Gallery’s The Michael Jackson Show show in Toronto, and which closed on Michael Jackson’s 45th birthday. As I stated in that peice, he had delusions of godlihood. I do not know if the Nordahl work has a title, but I’d imagine it acquiring the name ‘The Apotheosis of Michael Jackson’, and considering the default longevity of oil and canvas, it may become a type of Mona Lisa image of the 26th Century – something most people are familar with, but it will be few who will have actually looked up the surviving electronic documents to see the videos. 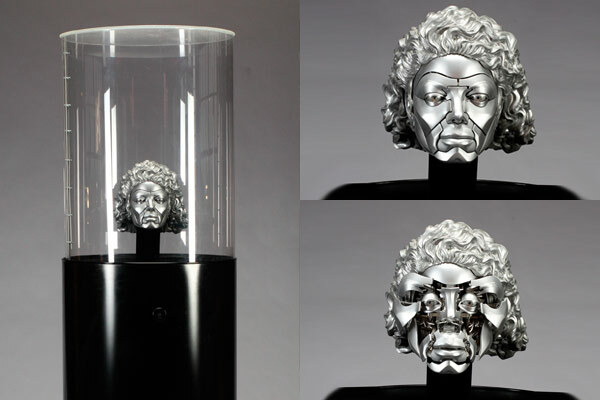 And this robotic head reminds me of the end of William Gibson’s Neuromancer. I found the slide show through a search for “David Nordahl”. The thumbnail for the following made me think he was a Mormon artist responsible for the type of images of white-Jesus amidst tanned-white-people Indians as seen in their texts. On clicking I see that instead it’s a very Socialist Realism depiction of Jackson that wouldn’t stand out from a collection of Maoist images from the Cultural Revolution. I would like to think that Nordahl is savy enough to have put Jackson in a red shirt for this reason – consider this painting “The Nordahl Code”. Herein lies coded images depicting truths about his interaction with this disturbed man, but I’ll leave that to the thriller novelists of the future. Frank Herbert, in his last novel Chapterhouse Dune, wrote of a Van Gogh painting which had survived the millenia and was a reminder to that cohort of humanity of an element of wildness in the human imagination. It is an eloquent passage about the importance and lasting effects of artwork. Jackson in turn stands as a testament to the WTF? element in the human, but this message speaks most clearly to us, the present living who shared the world with the living figure, but a century from now, these paintings, stripped of the context that we take for granted, will be a mess of mixed messages. 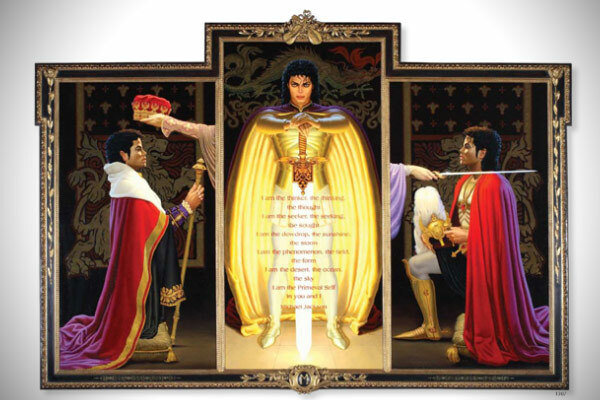 By this I mean that we know that Jackson’s thing for being depicted as a king comes from his marketing as ‘the king of pop’. And that the associated art is tasteless and ignorant. Jackson as a knight, or as a king … a schoolgirl of 2110 will have no reason to think that the man depicted there was not those things. Also, these works are a reminder that while painting we call ‘contemporary’ has become a blotchy mess of shapes, colour and tube turds, there remains this underground of figurative realism that ‘tasteless’ celebrities hire for their own personal propaganda. 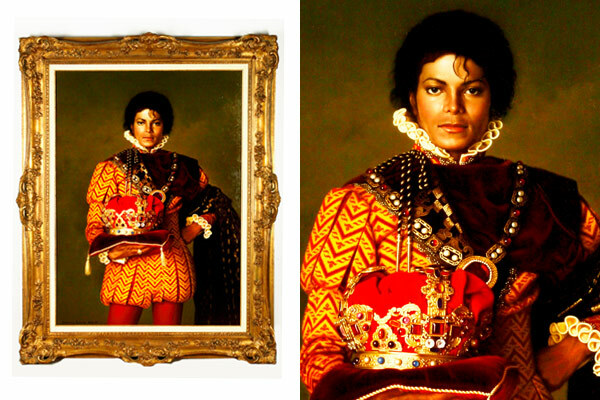 The tradition of Queen Elizabeth I, Louis XIV, Napoleon (ancient figures from a pre-photographic world shaping their image for the present and future generations) continues for the celebrity-royalty of today. The truly wealthy and powerful (billionaires) just support the museums and keep the industrial scale works they purchase in secret storage somewhere. 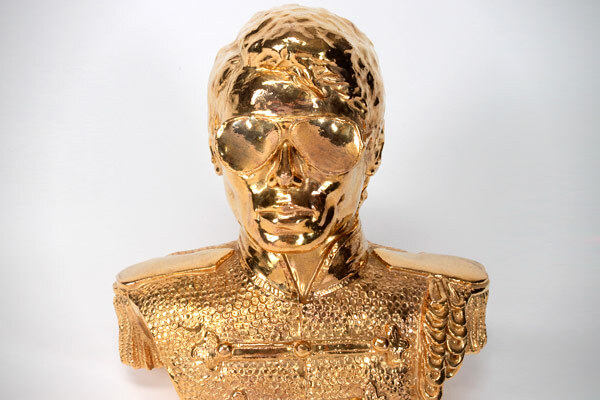 All of this came together in the late 90s for his History album, which included the construction of 10 statues, one of which was floated down the Thames. That he seemed to take this idea seriously is part of what made him so abhorrent. Michael Jackson was not a healthy man in any sense of the word. Those of us who take art seriously can see in it just how ill he was, and we can also recognize the depth of ignorance amidst his fans. That people have gotten tatoos ‘in memoriam’, that people leave glowing comments on his YouTube archive, is just another example and evidence of a failed education system. The art will echo down the centuries as a reminder that in the late 20th Century, Western soceity was totally fucked up.